in Buffalo's 10th game of the season tomorrow against the Toronto Maple Leafs. Hockey's Oilers (from Edmonton) just beat Detroit in a shootout, 6-5. I'm happy because Ales Hemsky got me three points in my hockey pool! Bryan Hall has been the most popular sports voice in Edmonton since starting as Edmonton Eskimos play-by-play announcer in 1965. But tomorrow night he broadcasts his final football home game. Hall is a unique man, with a brash, off-the-cuff style that he has become famous for. That, and long-winded questions that he often ends up answering himself. "Sometimes I don't have to say anything because he provides the question and the answer for me," said Eskimos head coach Richie Hall (no relation) with a laugh. The Eskimos honoured Bryan Hall yesterday by naming the Commonwealth Stadium media centre after him, and that’s where he will call his final Eskimos home game on Friday night against the Toronto Argonauts. Warren Moon, who gained fame as the Houston Oilers' quarterback, is one of 31 players/contributors recognized on the Edmonton Eskimo Wall of Honour at Commonwealth Stadium. (Scroll down to 2001). The earlier footage featured Warren Moon and he returns on this weekend's Bills' 50th Season Moment in the greatest comeback in NFL history. And you know who is going to win? So, sorry but boo hoo in Houston...Boo Hoo is also a band that formed in Montreal in 2005. Mark SancheZ, Ryan FitZpatrick and the word capitaliZe. The Bills won last Sunday against the New York Jets, 16-13, in overtime! landed seven of nine punts inside the Bills 20. Here is my game recap. This summer on the Voices.com blog, Stephanie Ciccarelli introduced us to Ann DeWig, the female promo voice behind the Super Bowl XLIII promos on NBC. Read the article here. And, more words of wisdom this past week from Ann in Stephanie's article, The Only Constant is Change. Stephanie adds," All of us are capable of leading the huddle. They happen at the same time each day and serve as great opportunities to learn, measure our daily progress, converse, and keep us accountable to each other. When you say you will be doing something publicly, it had better get done!" Voiceover lady Bobbin Beam is liking the Minnesota Vikings (one of four undefeated teams so far) more all the time, but will always be faithful to the San Diego Chargers and Brett Favre's old team, the Green Bay Packers. Bobbin says her hubby Pete is a Chicago Bears guy, so they have a "no taunting rule" when her beloved teams play his. GLASS - Watch the Top 10 shattering moments here. Hockey is represented 6 times and basketball twice - including #1! Well, the "balloon boy" stunt last Thursday was a hoax. NO doubt about it. Up-to-date details here. On a local level, a hot air balloonist got into some hot water late last month. The Buffalo Sabres beat the New York Islanders tonight, 6-3. They have now won four in a row after losing on opening night in overtime to Montreal. Tomorrow, October 17th, Buffalo hosts Atlanta. "SKATE Plus 8" TV show? Lots of goals last night in the Western Hockey League! 50 goals scored by 10 teams. The Shaw TV broadcast was in Saskatoon where the Blades scored 8 in beating the Kootenay Ice by 4. The Shaw TV crew will be there again November 4 for our fourth game of the broadcast schedule. on THE Washington Capitals' blog today. 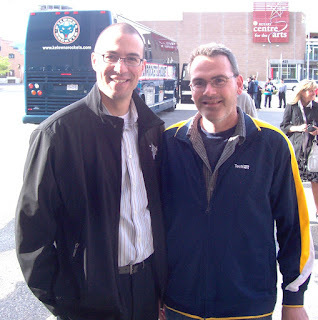 Visit that link for a great Sabres' flashback photo too! They know what they are talking about there, like "It was like playing in a Canadian city." Meanwhile, you can follow the NHL's "Battle of Alberta" here. BC hockey fans are breathing a little easier this morning. The Vancouver Canucks avoided losing 4 in a row last night by destroying Montreal, 7-1. Locally, the Kelowna Rockets won their 4th in a row thanks to a shootout winner by Cody Chikie. Cody is being billeted by a good friend of mine, Darryl J. Part of 4 exciting finishes! I handled PA at yesterday's Westside Warriors' 5-4 overtime win over Merritt. That was a great way to wrap up the game! Unfortunately on Friday night, yours truly and Westside experienced the opposite emotion as Vernon scored with 2.3 seconds remaining to beat the Warriors 4-3. Several blowouts in the NFL yesterday. Six games were won by 17 or more points. The worst was San Francisco shutting out the St. Louis Rams, 35-0. The second most embarrassing score was 38-10 for Miami over my Buffalo Bills. Cal Clutterbuck - Game 7 on October 17 versus Minnesota. The Canucks better see him on the ice or they will get crunched! Clutterbuck lead all NHL forwards in bodychecks last season with 356 - 71 more than Dustin Brown of the LA Kings. We are an army of young people who love each other like best friends (that's called kahoots) and desire to see people meet Christ, the source of all real life! I will be doing the public address announcing at tomorrow afternoon's Westside Warriors game. The Quesnel Millionaires will be the visitors. On Thursday the team gave me a call as the regular voice, Wayne Moore, realized he had a conflict with the Okanagan Sun football game he was committed to. So, three Sundays in a row coming up for me "high in the gondala." What a great word - made famous by the legendary Foster Hewitt! The Millionaires sort of have a billionaire in the lineup...on defense is a 17 year old named Tyler Billon. Hear all about the famed Maple Leaf Gardens broadcasting gondola and how its dizzying heights made strong men go weak in the knees by clicking here. This interview with Foster first aired in March of 1965. Besides being a very good voice talent, Kara Edwards is an avid photographer. 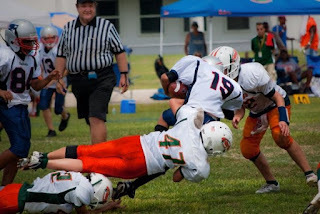 She snapped the one below at a recent Pee Wee football game in Tampa Bay that her neighbors' son was in. 33-20. Mr. Edwards had a quarterback rating of 97.5 against the Bucs. It was the 12th time in his career that he had a QB rating of 80.0 (minimum 20 attempts) or higher and the Bills are 11-1 when he reaches that mark in his career. Trent's only loss came in week one this season as New England eked out a 25-24 win. After two weeks of the NFL season, Trent Edwards has the fifth highest QB rating in the league at 104.9. Number one on that list is Drew Brees of the New Orleans Saints, who visit Buffalo this Sunday. Kara Edwards is also an avid blogger like me. We both started in late 2006. She currently leads in posts with 147. But I am now only two touchdowns behind with 133 posts...Time flies when you are having fun! Denver won by five and Jacksonville lost by two as they each scored 12 points today as the NFL season got rolling - but NO team scored 13. Oddly enough, I shared footage from Bills games against those two teams two posts back. However, the NFL season opener on Thursday saw Pittsburgh score a 13-10 overtime victory versus Tennessee. A date close to that was September 1, 1980. On that date, Canadian hero Terry Fox, stopped running outside of Thunder Bay, Ontario. His primary cancer had spread to his lungs so after 143 days and 5, 373 kilometres (3,339 miles), his Marathon of Hope came to an end. On June 28, 1981, after treatment with chemotherapy and interferon, Terry Fox died at Royal Columbian Hospital in New Westminster, BC. The annual Terry Fox Run went off all across Canada today. In Kelowna, 548 participants took part raising almost $22, 000 dollars for cancer research. Next year will be the 30th Terry Fox Run! It is an innovative and volunteer-led event, all-inclusive, non-competitive, with no corporate sponsorship, incentives or fundraising minimums. The Terry Fox Run for Cancer Research is taking place in New York City on October 17 at Central Park. More details here. Other international events are listed here. on the U.S. pop charts in September of 1984. In case you are keeping score, John McEnroe and Patty Smyth have been married for twelve years now - and I won my first match tonight in my fall tennis league! Denver hosts Chicago tonight in the lone NFL preseason game. The Buffalo Bills went into Denver late last season and won 30-23! This is the first video footage I am able to share from my work on the "Thurman Thomas Show." Here is early season footage from the Bills' second game in Jacksonville. Yesterday in Kelowna, Dany HEATley finally talked about why he wants to leave the Ottawa Senators. He should have done that months ago because his reputation has been tarnished since vetoing a trade to Edmonton. The Calgary Flames' American Hockey League (AHL) affiliate is now the Abbotsford HEAT - relocating from Quad Cities, Iowa. Two days ago, I spoke with their Director of Communications and Broadcast, Dave Sheldon. 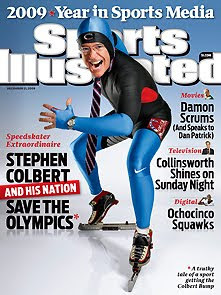 He is set to announce his color commentator in the broadcast booth and Dave says we will be surprised because his partner is not an athlete. A BIG thank you to Brent Luehr, Director of Technology, at HuStream Technologies here in Kelowna for spending a Friday afternoon converting the footage from an awkward (technically speaking) 353 mb UDF file from Sabreville. By the way, HuStream specializes in production of modern interactive video technology solutions for organizations throughout the world. To see a great new example, press play now when you arrive here. Or check out HuStream's portfolio! I am faster than Usain Bolt! Bolt burned up the track in Berlin two days ago setting a new 100m World record of 9.58 seconds! -- Clean Slate TV show airs across Canada the next two Saturdays (August 22 and 29). Here is the behind the scenes story. But my audition for an EA Sports racing video game was over Bolt's 9.58 seconds. My thanks to Herb Merriweather for his production help on that one. All for now...I continue my sports journey in a moment by "hitting the gym." Happy Birthday Sidney Crosby & Herb Merriweather! Sidney Crosby got to bring the Stanley Cup home today on his 22nd birthday! Nova Scotia hosted SC X 2. Two NHLers retired in the last 2 days. They each finished wearing number 27 (my niece, Jessica, hit this age 2 days ago) but never got to hoist the Stanley Cup in their 20-year careers. Teppo Numminen finished his career with the Buffalo Sabres while Jeremy Roenick finished up in San Jose. While Numminen was "normal", Roenick could be classified as "raucous." You can see it all here on TSN's Top 10 Jeremy Roenick Moments. I have a voiceover friend celebrating a birthday today in California. Herb Merriweather is a big sports fan too! The St. Louis Cardinals would be topping his list right about now. He also recently started blogging. You can follow Herb here. The late, great Michael Jackson came to Vancouver in 1984. He performed three sold-out concerts at B.C. Place but also had a run-in with police. However, that was a positive experience and NOT a negative one. See the story, picture and video here. will end after Tuesday's public memorial service. Remembering Michael Jackson in Music and in Sports. This is a good read from Michael Ielpi, a New Jersey Devils fan. 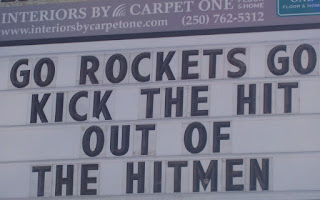 The Vancouver Canucks "stepped up to the mic" yesterday. GM Mike Gillis signed right winger Mikael Samuelsson to a three-year deal. 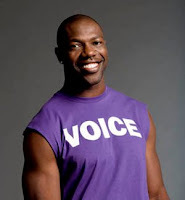 If you would like to "Step Up to the MIC" as a voiceover artist, you will want to click on this link for a book by Rodney Saulsberry. To all my US friends, I hope you have a great Independence Day coming up on July 4th! 5 marketing lessons from Ralph the artist. This is not from me but Atlanta voice-over talent, Karen Commins. Also new on the blogroll today is Atlanta's Craig Crumpton with Voice Actors in the News. 30 teams started the NHL race on October 4, 2008. Pittsburgh started the season with a pair against Ottawa in Stockholm, Sweden and tonight they start the Stanley Cup Final in Detroit. WhatIfSports.com predicts Detroit in seven games. My WHL colleague on Shaw-TV, play-by-play announcer Dan Russell, has predicted Pittsburgh in seven. I will go along with the Penguins but think they will "take it all" in six. Earlier this week, Shaw Communications and the Western Hockey League (WHL) announced they have extended their partnership for an additional five years. Shaw also had some exciting international coverage over the Christmas holidays that I voiced promos for. Bring on NHL coverage for Shaw I say! Anyway, a mass of Chris' in the Stanley Cup Final. For Detroit: Chris Osgood, Chris Chelios and Kris Draper. Pittsburgh has Chris Kunitz and Kris Letang. The Indianapolis 500 race is tomorrow morning. 33 cars will start the race. Here is the fast paced Marine Center of Indiana TV commercial I said I would post after my last blog entry. - UP 16 in the last three days! Tyler Myers and the Kelowna Rockets are in the final tomorrow afternoon for the Memorial Cup to decide Canada's best junior hockey team. They will be taking on the Windsor Spitfires from the Ontario Hockey League. Proving again it is a small world, I began work yesterday for a new client in Windsor - an elearning company. Do you want to be Canada's next Sportscaster? You could be drafted by the Score television network. This week on their blog, the Score linked to the sportscasting exploits of Shaquille O’Neal and the Buffalo Bills' Terrell Owens. UNLESS you are standing next to a 6’8” hockey player named Tyler Myers! It is worth mentioning again that he was the MVP of the Western Hockey League Final against Calgary, just like he was in the Western Conference Final against Vancouver. His incredible season included signing a pro contract with the Buffalo Sabres last Monday. was the same one (RTV6) I did a boat commercial for at the end of April. I will post a link to it when I get a copy. Last night's show got quite the response! RTV6 has a detailed article here with links about Bernard McFarland, the single father of three who mentors area youth. Tonight on ABC-TV they launch the fifth edition of "The Bachelorette." Jillian Harris became a fan favorite on the last edition of "The Bachelor." She lives in Vancouver but grew up right here in Kelowna, BC. Her Dad makes a prediction for the show here from his home in Kelowna. “It’s a small world” at Disneyland opened five weeks after I was born on April 22, 1964. Here is an informative historical discussion of the attraction. Live Long and Prosper are the words that accompany the Vulcan salute. It is a hand gesture consisting of a raised hand, palm forward with the fingers parted between the middle and ring finger, and the thumb extended. Thank you Leonard Nimoy! The new "Star Trek" movie looks to be a big hit and features an appearance by Nimoy. This review says it Should Live Long and Prosper. BUT the Rockets boarded their team bus and had a charter flight waiting at the airport. The Rockets won the Ed Chynoweth Cup Saturday at Prospera against Calgary! The game went into overtime with Kelowna winning 3-2. 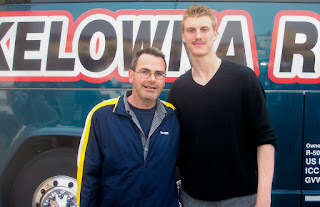 The MVP of the Finals, as he was in the Western Conference Final against Vancouver, was Tyler Myers. His incredible season included signing a pro contract with the Buffalo Sabres on Monday! Here is the link off the Sabres' website. I ended my last post with "the scoop" on some NHL coaches. 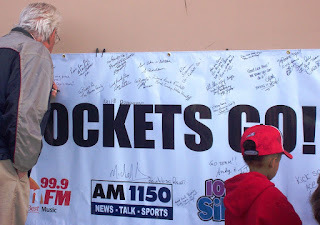 Here I am this morning with the Rockets' Ryan Huska, the seventh head coach in Rockets franchise history. He is very calm, cool and collected behind the bench and has a bright coaching future ahead of him. He is only 33. How can you go wrong with someone who has the initials RH? Happy birthday tomorrow to Roy Halladay! The Blue Jays' ace turns 32 - same as his number. Detroit, Anaheim, Chicago and Vancouver all played in the NHL playoffs. The latter has 9 letters but Canucks has 7:) Chicago rallied late on home ice to tie their series with Vancouver at two games each. The Hawks won in overtime, 2-1. Former Calgary Hitmen junior Andrew Ladd scored in overtime to win it for the Blackhawks. He scored 57 goals over two seasons with Calgary - including the playoffs. His pro career (including the postseason) has now seen him score 51 times. Randy Carlyle and Mike Babcock. There is a new hockey website out now called Make It Seven. Jim Balsillie of BlackBerry maker Research In Motion is attempting to buy the financially ailing Phoenix Coyotes (yes, 7 letters in the city and name) and move them to Hamilton. It would be Canada's seventh team. Phoenix came into being when the Winnipeg Jets moved there in 1996. I would actually love to see Phoenix go back to Winnipeg! At the time of the Jets' move to Phoenix, it was estimated that about 600 area children played organized hockey. The number in Winnipeg — with roughly half the population — was around 24, 000. There you have a tale of two cities - starting with P and W.
Another tale of two cities - starting with P and W - takes place Friday night in Pittsburgh. Washington visits with a 2-1 series lead in the best-of-seven. Anaheim coach, Randy Carlyle, has a lot of good memories as a defenseman in Pittsburgh. He won the James Norris Trophy in 1981 as the NHL's best. Carlyle played six years there before moving on to Winnipeg for parts of ten seasons. The coaches in question Friday night (Caps' Boudreau and Pens' Bylsma) go back more than 15 years. Here is the article - "hot off the press" from the Washington Post.